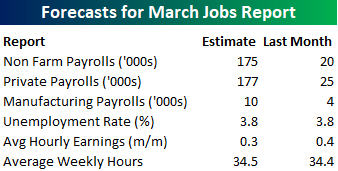 Heading into Friday’s Non Farm Payrolls (NFP) report for March, economists are expecting an increase in payrolls of 175K, which would be a major improvement from February’s paltry reading which came in at just 20K for the tenth biggest miss relative to expectations since at least 1999. In the private sector, economists are expecting an increase of 177K, which would imply a similar increase versus February as the headline reading. The unemployment rate is expected to remain unchanged at 3.8%. Average hourly earnings are expected to grow at a rate of 0.3% versus the 0.4% reading last month. Finally, average weekly hours are expected to be unchanged at 34.5. One trend worth highlighting about recent NFP reports is that they have been extremely volatile relative to expectations. In each of the last three months, the originally reported number was off the mark by at least 100K for an average of 142K above or below expectations. Since 1999, there have only been three other periods where the original number was that far off expectations by at least 100K for three months in a row, and the last occurrence was in 2004. Ahead of the report, we just published our eleven-page preview of the March jobs report. This report contains a ton of analysis related to how the equity market has historically reacted to the monthly jobs report, as well as how secondary employment-related indicators we track looked in March. We also include a breakdown of how the initial reading for March typically comes in relative to expectations and how that ranks versus other months. One topic we cover in each month’s report is the S&P 500 stocks that do best and worst from the open to close on the day of the employment report based on whether or not the report comes in stronger or weaker than expected. In other words, which stocks should you buy, and which should you avoid? 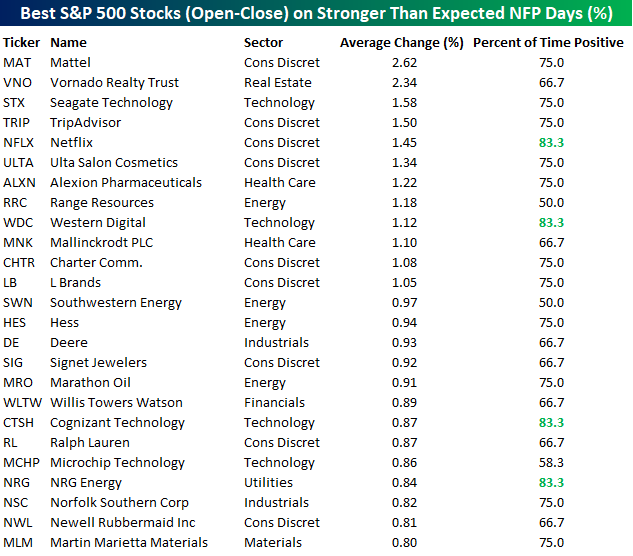 The table below highlights the best-performing stocks in the S&P 500 from the open to close on days when the Non-Farm Payrolls report has been better than expected over the last two years. Of the top performing stocks on days when NFP beats expectations, nine sectors are represented, but Consumer Discretionary leads the way with nine. Mattel (MAT) has been the best performing stock with an average open to close gain of 2.62%, but another eleven have seen average open to close gains of more than 1%. In terms of consistency, Netflix, Western Digital, Cognizant, and NRG have all been positive 83% of the time. For anyone with more than a passing interest in how equities are impacted by economic data, this March employment report preview is a must-read. To see the report, sign up for a monthly Bespoke Premium membership now!